SmartDriveDuo-30 is one of the latest smart series motor drivers designed to drive medium power brushed DC motor with current capacity up to 80A peak (few seconds) and 30A continuously, each channel. This driver is designed specially for controlling differential drive mobile robot using RC controller. 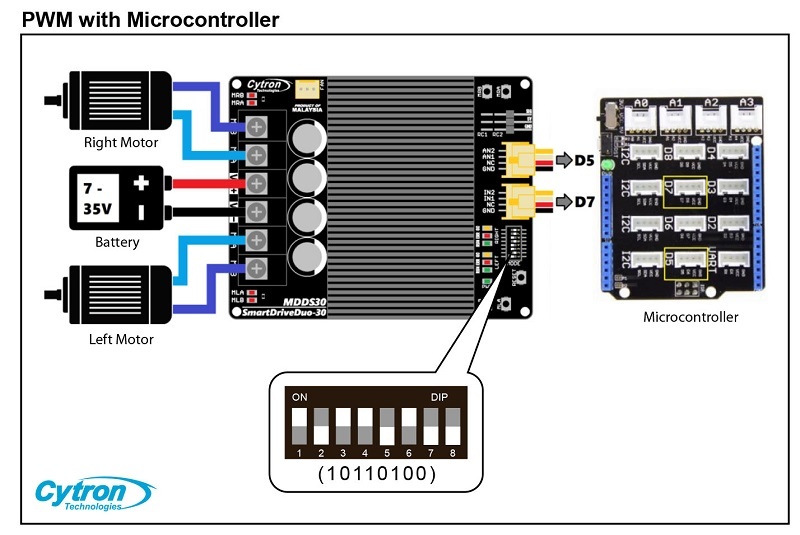 Nevertheless, MDDS30 also can be controlled using analog joystick or microcontroller (PWM, Serial). MOSFETs are switched at 18 KHz to ensure quiet operation and no annoying whining sound. Besides, it also equipped with a microcontroller unit to provide smart features such as multiple input modes and current limit and thermal protection. Bi-directional control for dual brushed DC motor. Support motor voltage from 7V to 35VDC. Maximum current up to 80A peak (1 second), 30A continuously, each channel. On board MOSFETs are switched at 18 KHz for quiet operation. Multiple input modes: RC, Analog/PWM, Serial Simplified and Serial Packetized. GROVE compatible connectors for control input. RC (Radio Control) friendly connectors. On board push buttons for fast test and manual operation. On board LED indicators for Error, RUN, Over current, motor output, for each channel. NO POLARITY PROTECTION FOR V MOTOR.